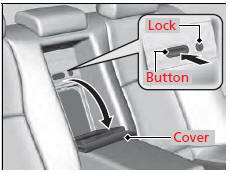 Pull the rear seat armrest down and push the button to open the cover. You have access to the trunk from this opening in the rear seat-back. The cover latches when you push it back to the original position. You can lock and unlock this cover using the built-in key.